In this guide, learn all of the answers to 18 practical OPC frequently asked questions (FAQs) to help you on your way to a deeper understanding of OPC UA, DA, A&E and HDA technology and how they can help you. What does the OPC acronym stand for? What's the difference between an OPC client and OPC server? Why do I need OPC servers if my control hardware vendor says they support OPC? Do OPC servers have to run on server-class computers and operating systems? If I have multiple brands of devices do I need multiple OPC servers? How can 2 OPC servers talk to each other? How can 2 OPC clients talk to each other? Can OPC UA talk to OPC DA and vice versa? My OPC Server doesn’t support OPC UA yet but my OPC client does, what do I do? Can OPC DA 2 and DA 3 clients and servers talk to each other? What are OPC data quality and timestamps all about? I need to share data between a control system and metering system, or between 2 control systems – how do I do it with OPC? Where should my OPC servers be placed in my network security model? I need redundancy in my OPC system, how do I do that? 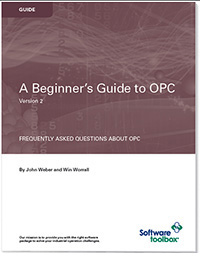 Complete the form at the right to receive an email with an immediate download of this free beginner's guide to OPC.